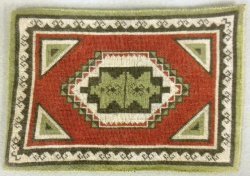 Another exquisitely stitched rug from the same group, at least 40 stitches to the inch. Lined in china silk. Click for detail. 3-1/4" x 4-3/4".